A few weeks ago, on a freezing cold day, I was talking to my sister and telling her how depressed the drab winter was making me. I said I just needed something to busy myself with (in addition to my full time job, two kids, new house, etc.). 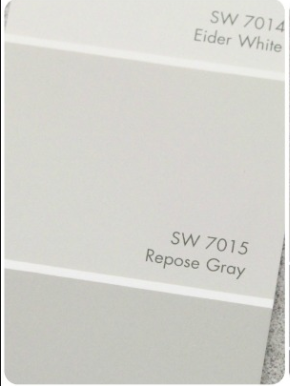 I told her I might paint some white stripes on the grey walls going up our staircase. I had seen this picture in the Pottery Barn Kids catalog the weekend before and was inspired to try it out. My sister laughed at me and said "Yes, why don't you go paint some stripes. On your walls. Today". Sensing her sarcasm and loving a challenge…I did it! And here is the outcome. Preeeeetttty impressive huh??? 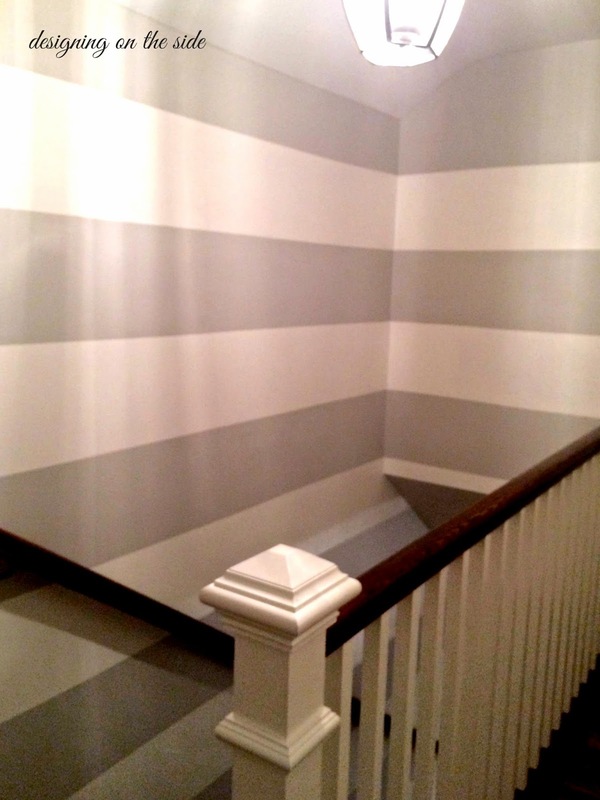 My husband said the stripes highlighted how curved the wall is. The builder said that the stripes looked super straight. No issues there huh? 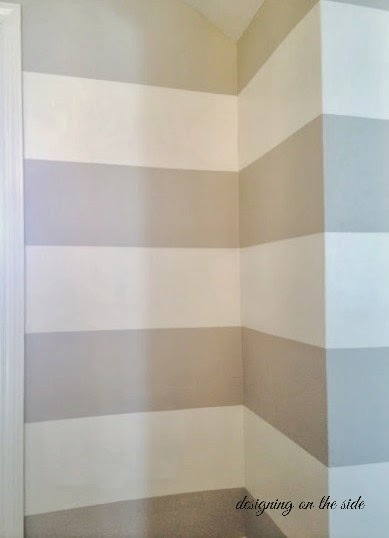 First things first, I Googled "How do you paint stripes on walls without going insane" and found out that the most important trick is to get the right tape and a level. 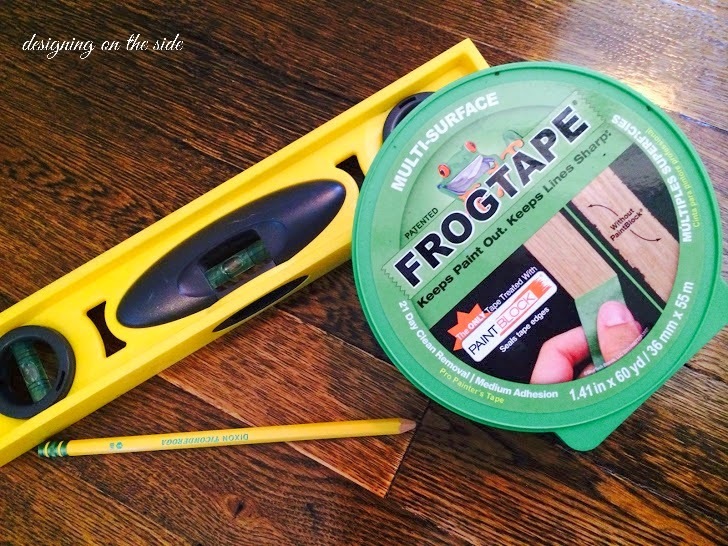 The tape of choice seems to be this green Frogtape brand and I have to agree - it's pretty fantastic. After deciding that the easiest thing to do was make the stripes each 12 inches wide, I started drawing and taping. Getting the lines straight was not the easiest thing to do and took a lot of time measuring and marking and then erasing and starting over. Luckily that day's work included listening to a Senate Sub Committee hearing on Alzheimer's disease which lasted a few hours. Lots of time to listen and draw lines. Once I was sure they were level, I started taping. I tried my best to keep the tape in one piece so I didn't have a lot of joints. 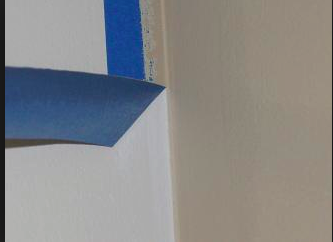 After the tape was up and I re-checked to make sure it was all nice and level, I painted over the edges of the tape in the ORIGINAL wall color - in this case Sherwin Williams Repose Gray (SW 7015). that way if any of the paint seeped through the tape, it would be grey not white. Make sense? By the way is it Grey or Gray? Who knows! 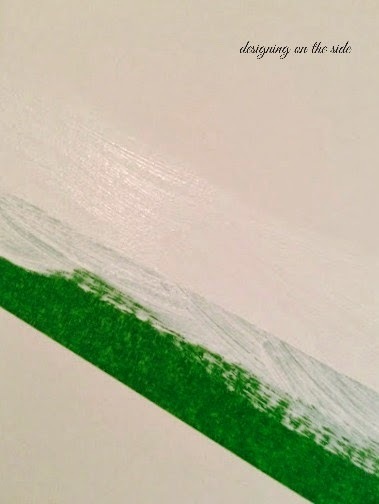 After that dried, I painted the white paint in between the tape. In this case, I used the same color as the trim in the rest of the house which is Sherwin Williams Alabaster in semi-gloss. I really liked the way the semi-gloss looks up against the matte grey/gray. 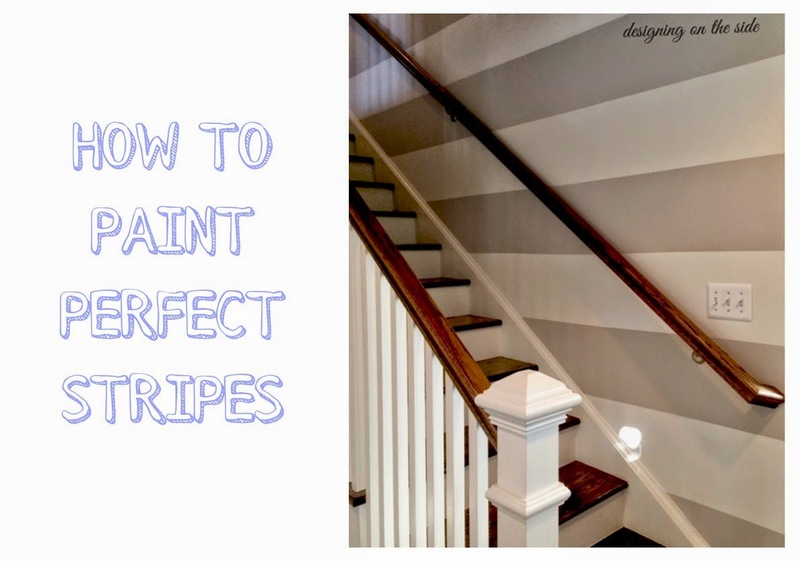 Each white stripe took about 2 coats using a roller paint brush. The hardest part by far was the fact that this was in a stairwell. 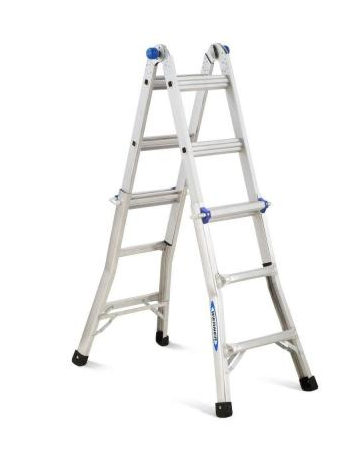 Most of the top part of the walls were way above my head - so I went to Home Depot and get a ladder that works on the stairs like this one which was about $80 but worth it and I know we'll use it again. 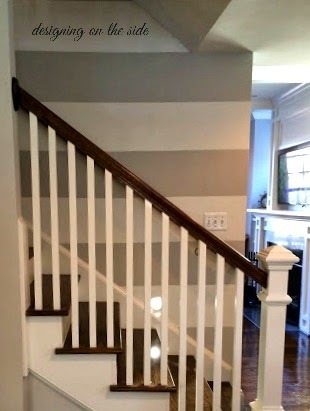 Getting the ladder allowed me to put my life in danger to create these stripes at the top of the stairs. Good thing I am not afraid of heights…oh wait…I am. So that's the deal on stripes! I highly recommend trying it. In a later post, I'll show you how i decorated the upstairs area.